These Ladder Ribbon Lei necklace and choker are incredibly beautiful, alluring and absolutely eye-catching! The best part is - it is so easy to make and very gratifying. No knitting or crochet skills are required. All you need are a tapestry needle, some regular yarn or elastic cord, and our scrumptious ladder yarns that are available in a plethora of gorgeous colors. There are no metallic findings in the Ladder Ribbon Lei necklace and choker. The Ladder Ribbon Lei choker is made using an elastic cord at its core, eliminating the need for clasps at the ends of the necklace. The Ladder Ribbon Lei necklace and choker make superb gifts. They are easy to maintain and suitable for travel. Make one or several for family and friends. They will be glad you did! Length of necklace can be varied by using a longer or shorter yarn for the core. 1 necklace uses about 2/3 of a ball of ladder ribbon yarn according to this pattern. With the ladder ribbon and core yarn held together, make an overhand knot about 6" at one end. Thread the other end of the core yarn through the tapestry needle. Insert the needle (from top to bottom) into the first available space on the ladder ribbon from the knot and through the next space on ladder ribbon (from bottom to top). Weave the needle through the spaces of the ladder ribbon in this manner for the next 10-12 spaces and pull the core yarn through the spaces. Continue to weave the tapestry needle through the spaces on the ladder ribbon, making sure from time to time that the ribbon is pushed down the core yarn and pushed down TIGHTLY. Once the necklace is about 24", make an overhand knot with both yarns and cut the ladder ribbon, leaving about a 6" tail. Taking both ends of the lei necklace, tie a Surgeon's knot close to the knots on both ends and trim the ends. 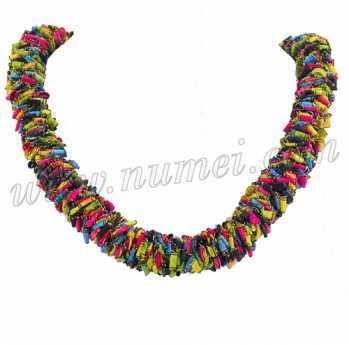 Weave the ends into the lei necklace. Thread the other end of the core yarn through the tapestry needle. Insert the needle (from top to bottom) into the first available space on the ladder ribbon from the knot and through the next space on ladder ribbon (from bottom to top). Weave the needle through the spaces of the ladder ribbon in this manner for the next 10-12 spaces and pull the core yarn through the spaces. Continue to weave the tapestry needle through the spaces on the ladder ribbon, making sure from time to time that the ribbon is LOOSELY pushed down the core yarn. Once the necklace is about 28", make an overhand knot with both yarns and cut the ladder ribbon, leaving about a 6" tail. 28" of round elastic cord (1-1.5 mm; or 1/16") for the core; any color. Thread the other end of the core yarn through the tapestry needle. Insert the needle (from top to bottom) into the first available space on the ladder ribbon from the knot and through the next space on ladder ribbon (from bottom to top). Weave the needle through the spaces of the ladder ribbon in this manner for the next 10-12 spaces and pull the core yarn through the spaces. Continue to weave the tapestry needle through the spaces on the ladder ribbon, making sure from time to time that the ribbon is pushed down the core yarn and pressed down TIGHTLY. Once the necklace is about 16", make an overhand knot with both yarns and cut the ladder ribbon, leaving about a 6" tail.